Washington, D.C., circa 1924. "Palace Laundry (Elite Laundry)." National Photo Company Collection glass negative. View full size. Submitted by pattyanne on Sat, 10/08/2011 - 10:56pm. I remember my mom sprinkling the clothes, rolling them up and putting them in the frig in the summer (humid in Mpls) and she also got a mangle for ironing sheets. Whoever irons sheets? Mom did, plus my dad's underwear, etc. Times were different. I am 63 and a lot sure has changed. (She says as she checks her iPad). Ha ha ha. Whole new world! Submitted by squidpants on Wed, 09/14/2011 - 11:53pm. So I've been doing some research. The address is 2902, which means probably somewhere in Columbia Heights, Georgia Ave area, or Georgetown. Judging by the buildings in the window reflections, I would guess Columbia Heights. The reflection looks a lot like 2901 14th Street, although one window seems to be circular at the top rather than square. Submitted by phule on Fri, 07/08/2011 - 2:42pm. I noticed that this is not the first Elite Laundry shop to be featured here. I wonder if anyone has been able to narrow down a possible location of this newest one? Submitted by EvenSteven on Fri, 07/08/2011 - 2:39pm. I wonder if someone after writing name plainly and pulling the handle ever dropped the clothes on the entryway instead of inside the door. Submitted by Stefan on Sat, 07/02/2011 - 3:06am. If I remember correctly they were attached to the shirt at the back with a stud. Another stud at the front kept it together there. At school it was always a problem not to lose the studs. I suppose the theory was that collar was the part that became grubbiest first and so could be changed mid-week. Shirts were changed once a week - less of a problem than you might think in cold England before central heating. Submitted by Dale Neiburg on Fri, 07/01/2011 - 2:46pm. Collars and cuffs used to be separate units from the body of the shirt. (I'm not sure how they were secured -- this was even before my time.) The theory was that they were the part that got dirty, while most of the shirt remained (relatively) clean. That way, you could wear the same shirt for days, only replacing the visible dirty parts as needed. Submitted by TechnoBuff on Fri, 07/01/2011 - 12:07pm. Although the caption states that the photo is "circa 1924", there is evidence that it is a bit later than that. The radio shown in the store window next door is a Atwater Kent Model 35, which according to Alan Douglas's "Radio Manufacturers of the 1920s", was introduced in July 1926. Indeed my Atwater Kent catalog dated September 1925 does not yet show this groundbreaking model. The Model 35 was a single tuning dial battery radio, which was a breakthrough in convenience when it was introduced. The Model 35 was also the first Atwater-Kent model to be housed in a metal case, a feature that allowed A K to lower the price by a reported $15. Shorpy has in the past featured a number of photos taken inside the Atwater Kent Philadelphia factory. The second radio, only partially visible, appears to be an RCA Model 16, introduced in September, 1927, again according to Douglas. I'm not sure what the item is in the small box below the Atwater Kent. It looks vaguely like either a transistor radio or a pocket calculator, so perhaps the picture is actually much newer! Submitted by Kairho on Fri, 07/01/2011 - 6:06am. And I also remember my mother dyeing various textile things in the washing machine. The next load was always quite iffy, if not spiffy. Submitted by Kairho on Fri, 07/01/2011 - 6:04am. Some day I need to go research how collars could be separate from the shirts. Do not believe I have ever seen that and I'm semi-ancient myself. Just checked and the sole vinegar in our pantry* is in a glass bottle. *is this word still used? Submitted by noelani on Thu, 06/30/2011 - 9:18pm. My dad used a sprinkle bottle, too, for his Marine Corps uniforms. Mom couldn't do it perfectly enough to suit him, so he did them himself. My aunt apparently LOVED to iron! Even after she got a drier, she would pull clothes out of it while they were still warm, sprinkle them, and shove them into a pillowcase, to make sure they were good and wrinkled! She even did that with my cousin's jeans. He found it a bit embarrassing going to high school in starched and creased Levis! Submitted by Mudhooks on Thu, 06/30/2011 - 6:59pm. When we went to Scotland back in 1962, my mother was telling her cousin about how she had an electric washer and dryer. Her cousin thought Canada must be terribly backward that homes didn't have "drying cupboards" -- narrow metal cabinets with a gas heater that you would hang your clothes in to dry. "An hour or so later, they're dry!" Mom tried, to no avail, to explain that 20 minutes in a tumble dryer would dry an entire load of washing, from socks to bedsheets. Submitted by aenthal on Thu, 06/30/2011 - 5:31pm. Yes, my mother also had a sprinkling bottle for ironing. And she put clothes in the refrigerator. But she didn't sprinkle them to put them in the refrigerator. She took them out of the electric dryer half done, so they could go there. The sprinkle bottle was to touch up things that needed more detail ironing, or things that had wrinkles but had not been washed. Submitted by Julian_from_Edin... on Thu, 06/30/2011 - 3:45pm. I'm often surprised at the level of detail these photos capture. 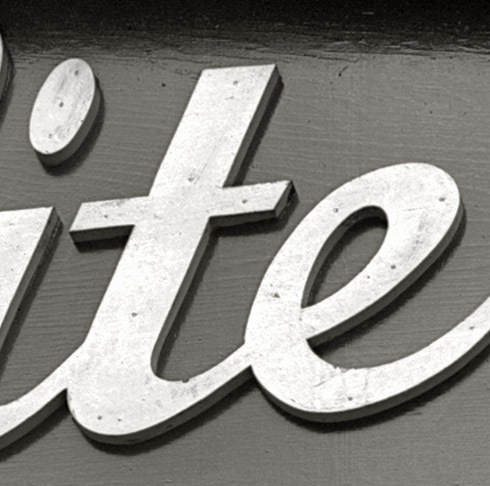 The first thing I noticed was that "Elite" had been painted directly onto a quite roughly finished board. You can quite clearly see the knots under the paintwork. A very impressive camera. Submitted by Greycat on Thu, 06/30/2011 - 3:45pm. I remember my grandmother using one one of those sprinkler bottles. I also remember her boiling rice the night before and straining the liquid through many layers of cheesecloth to remove any stray grains of rice. Then she would use that to starch shirt sleeves, cuffs and collars, also pant legs as well. Submitted by ADKrick on Thu, 06/30/2011 - 3:36pm. On the lower left, in the neighboring store, sits a nice radio. And on the lower right, in the reflection, is a white car. Pretty unusual back then. Submitted by suecris on Thu, 06/30/2011 - 2:50pm. My mom didn't just refrigerate her sprinkled clothes, she sometimes put them in the big chest freezer if it was going to be a few days. We had a big mangle iron, too. My Mom got so good with it she could do men's dress shirts with it. Submitted by beachgirl2 on Thu, 06/30/2011 - 2:31pm. I still iron, though not like before. In Maryland, the summers are VERY sultry, and we did refrigerate sprinkled clothing. The distilled water was recommended so that there would not be a mineral buildup inside the steam vents of the iron. It disabled the steam setting of the iron by clogging up the vents. Today I use tap water. Your mother was a real pro in many areas of housewifery, tterrace, and I admire that. Submitted by Sgt McG on Thu, 06/30/2011 - 2:17pm. In "Washington Goes to War", David Brinkley described the process used to clean a linen suit. The suit would be disassembled, then each piece washed by hand. The pieces would then be hung to dry on the roof, and finally put back together. Ten bucks, and a weeks time (longer in cloudy weather). Submitted by Mudhooks on Thu, 06/30/2011 - 1:56pm. I recall recycled glass vinegar bottles with holes punched in the top being used to dampen clothes before ironing (before the advent of the steam iron). Sometimes the holes had already been punched because we used to sprinkle our French fries with vinegar right from the bottle. Even the restaurants did this before they came out with the little vinegar dispensers. Heinz sold their vinegar in glass bottles before they came out in plastic. I still have an old vinegar bottle around here someplace. Submitted by tterrace on Thu, 06/30/2011 - 1:27pm. I sure remember the sprinkling-water part of my mother's ironing procedure. We didn't have much humidity in No Calif, so she never did the refrigerating-the-wash bit, though. One aspect always fascinated me: she'd buy gallon jugs of distilled water from the drug store to use with her steam iron, rather than tap water. We also had an ironer, or "mangle" as I've since learned it's sometimes called. A big white-enameled thing she'd have to wheel out into the kitchen to use. Did sheets on it, I think. I can't remember where the thing was stored when not in use. Drying was strictly a clothesline affair until we finally got a dryer sometime in the late 60s. Submitted by Lord-Velveeta on Thu, 06/30/2011 - 12:46pm. 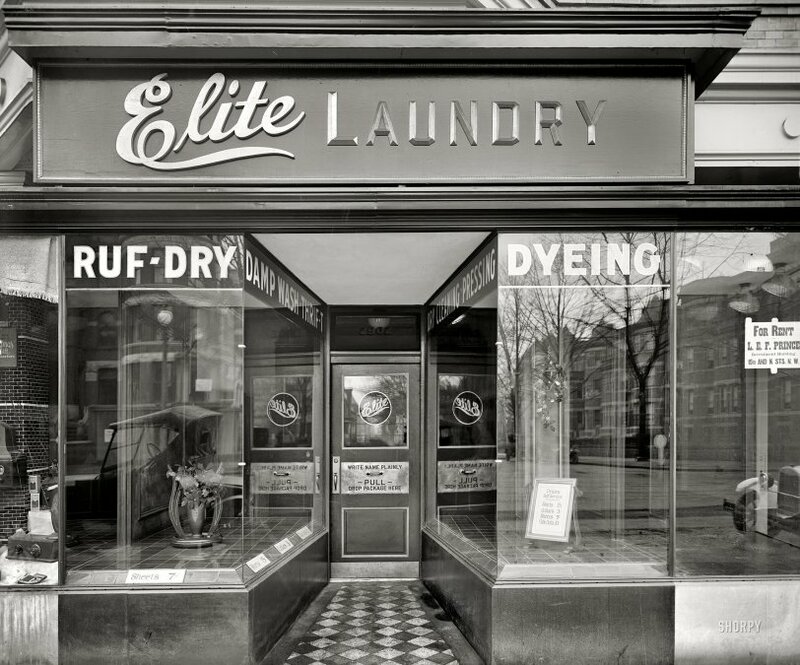 "Elite" Laundry! Don't you bring your old low class rags here, we only wash the best and fanciest clothes. But seriously, I love those deep commercial entrances with long display windows on each side of the door. It has a classy look lost in todays cookie cutter strip malls. Submitted by RDown3657 on Thu, 06/30/2011 - 12:36pm. I well remember the sprinkling bottles, OTY. And I also remember what clothes pins were for. In fact, as I push birthday #75, I remember a lot of things you don't see any more. But good riddance to many of them! Submitted by OTY on Thu, 06/30/2011 - 3:51pm. Does anyone else alive today remember the "sprinkling bottles" our moms used to have which were hand-shaken, pierced "hose nozzle" type gadgets with corks (that fit into the bottles of water) that she used to sprinkle clothes, roll them up and have them prepared for ironing? If the weather was humid and one did not get around to ironing them the same day, the rolled-up clothes, linens, whatever, had to be refrigerated in a towel or allowed to hang and dry again to keep them from getting mildew spots. Please let there be somebody else who remembers this.